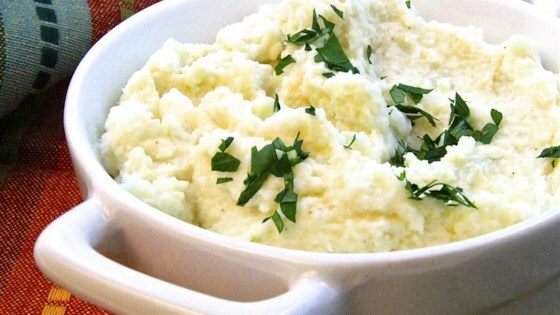 "For those of us low-carb peeps who like to pretend that we are eating mashed potatoes. Serve with butter if desired." Bring a large pot of lightly salted water to a boil. Cook cauliflower in boiling water until tender, about 6 minutes; drain. Pat cauliflower dry with paper towel to remove as much moisture as possible. Blend cauliflower, cream cheese, garlic, and seasoned salt in a food processor until mostly smooth. Really good! I used part skim ricotta to lighten it up a bit and I would recommend this recipe for sure.